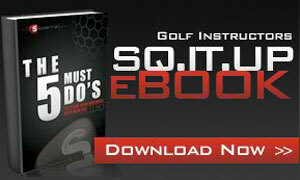 By far one of the biggest frustrations for golfers is mastering the proper backswing sequence. Everyday on my lesson tee, I have players from all over the world telling tales of woe as it relates to how much they have struggled in this critical area. 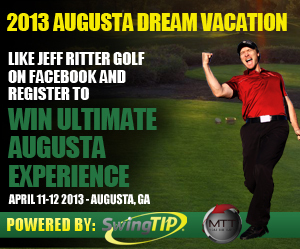 Your golf swing is highly reactionary, meaning each movement is built upon the one before it. With this idea in mind, It’s safe to say that possibly the two most critical junctures of the swing are the start and the transition. Screw these two up and you’re in for a long day! 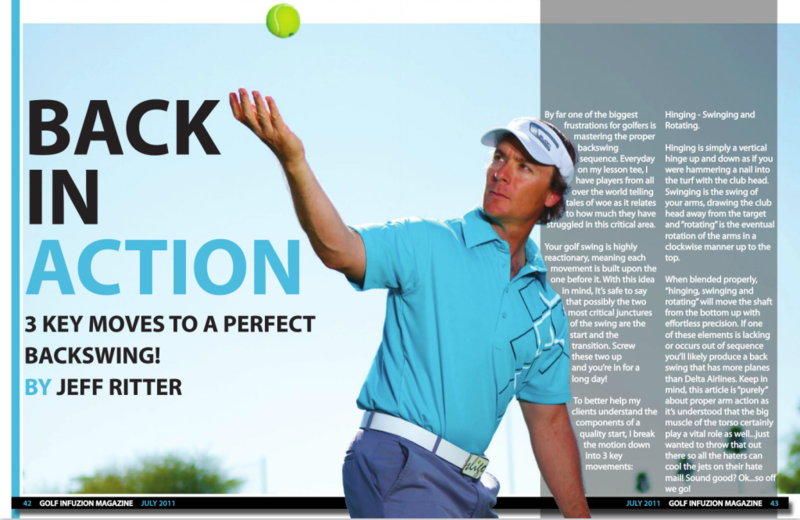 To better help my clients understand the components of a quality start, I break the motion down into 3 key movements: Hinging – Swinging and Rotating. 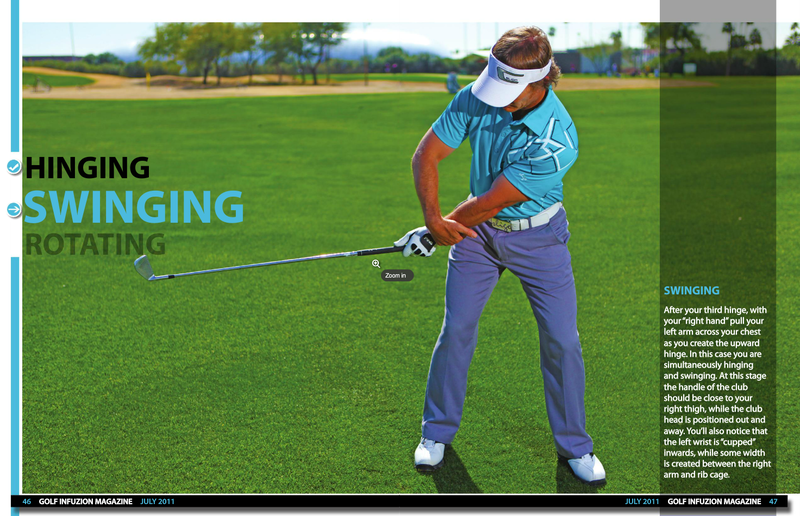 Hinging is simply a vertical hinge up and down as if you were hammering a nail into the turf with the club head. Swinging is the swing of your arms, drawing the club head away from the target and “rotating” is the eventual rotation of the arms in a clockwise manner up to the top. When blended properly, “hinging, swinging and rotating” will move the shaft from the bottom up with effortless precision. If one of these elements is lacking or occurs out of sequence you’ll likely produce a back swing that has more planes than Delta Airlines. Keep in mind, this article is “purely” about proper arm action as it’s understood that the big muscle of the torso certainly play a vital role as well…just wanted to throw that out there so all the haters can cool the jets on their hate mail! Sound good? Ok…so off we go! Start by taking your grip in your left hand only. 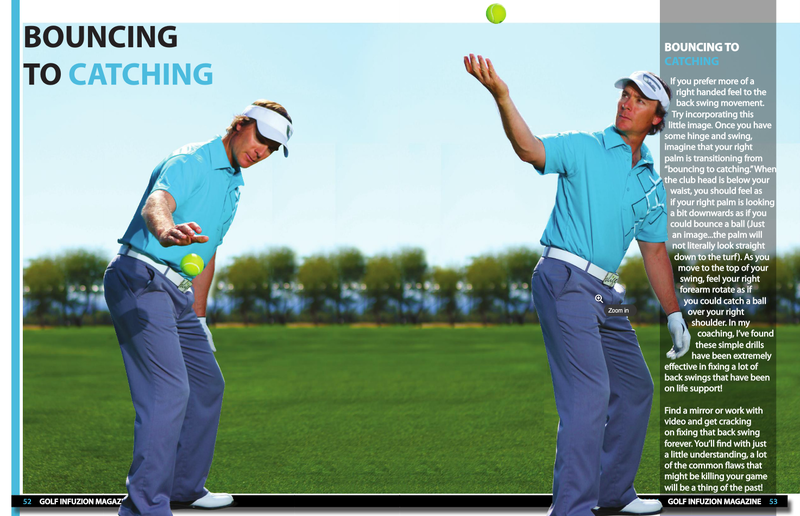 Grab the back of your left wrist with your right hand to isolate the movement. Hinge the club head vertically up and down 3 times. After your third hinge, with your “right hand” pull your left arm across your chest as you create the upward hinge. In this case you are simultaneously hinging and swinging. At this stage the handle of the club should be close to your right thigh, while the club head is positioned out and away. You’ll also notice that the left wrist is “cupped” inwards, while some width is created between the right arm and rib cage. As you “hinge and swing,” the club head is easily working off the turf as it swings from low to high up to the top. The final component to the sequence is “rotating” which serves to round out the top of the swing, settling the club head and shaft onto perfect plane. As you approach the top of the back swing, take your right hand (still grasping the back of your left arm) and rotate the left forearm to the top. This action with the right hand in this drill is the same action you would feel if you were revving up the engine on a motor cycle. At the top of the back swing, the shaft, face, left arm and shoulder pitch should be roughly falling into parallel alignments with one another. You’ll also notice that the left wrist has flattened out a bit matching it nicely to the rest of the top of swing positions. Notice what a disaster this back swing has become. The club head has swung severely around at the start, which is a common death move for players. 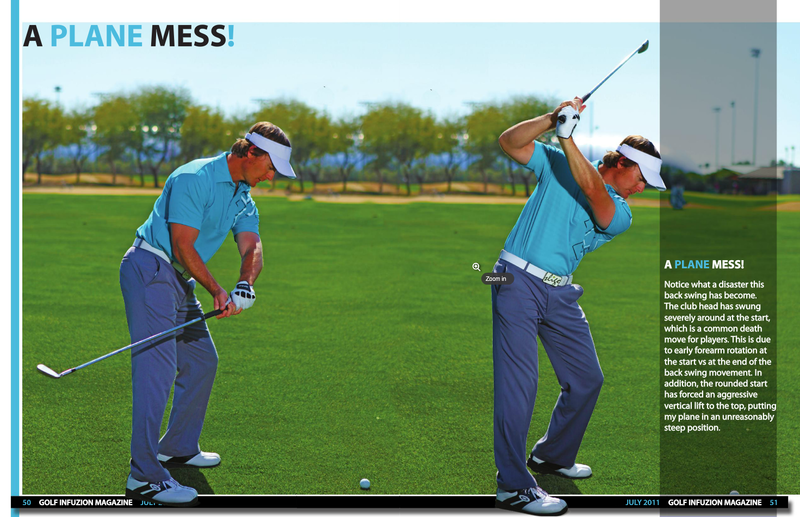 This is due to early forearm rotation at the start vs at the end of the back swing movement. In addition, the rounded start has forced an aggressive vertical lift to the top, putting my plane in an unreasonably steep position. If you prefer more of a right handed feel to the back swing movement. Try incorporating this little image. 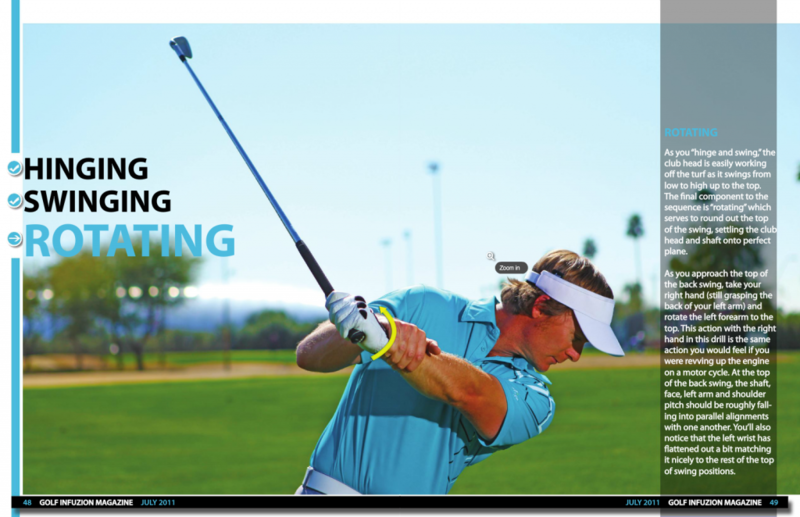 Once you have some hinge and swing, imagine that your right palm is transitioning from “bouncing to catching.” When the club head is below your waist, you should feel as if your right palm is looking a bit downwards as if you could bounce a ball (Just an image…the palm will not literally look straight down to the turf). As you move to the top of your swing, feel your right forearm rotate as if you could catch a ball over your right shoulder. In my coaching, I’ve found these simple drills have been extremely effective in fixing a lot of back swings that have been on life support! 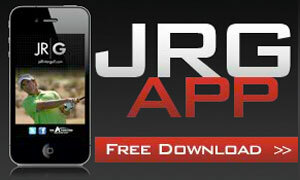 Find a mirror or work with video and get cracking on fixing that back swing forever. You’ll find with just a little understanding, a lot of the common flaws that might be killing your game will be a thing of the past! 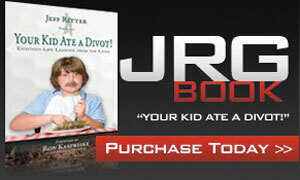 For more information on JRG and “Make The Turn” Click Here.